Cycles of over- and undersupply in commercial real estate (CRE) have occurred on numerous occasions. 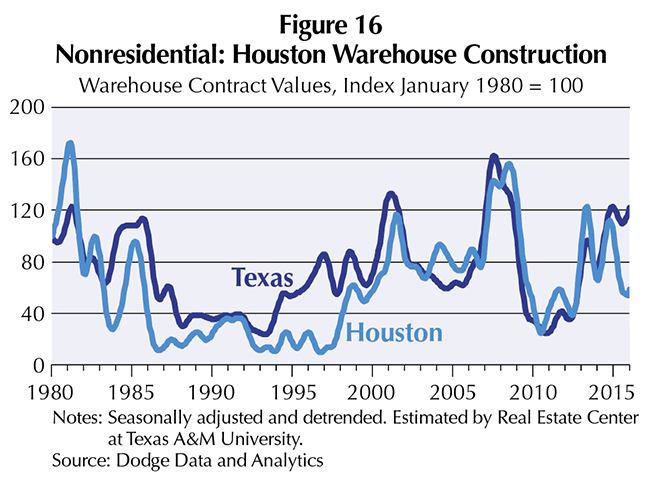 In the 1980s, commercial construction boomed in Texas, fueled by oil prices and tax laws, resulting in a massive oversupply of commercial space. This created serious problems for financial institutions. Construction of commercial buildings, particularly office buildings, has always been cyclical in nature. The lags between conception and completion pose a critical problem. Because buildings can take several years to complete, economic conditions when a commercial building is delivered may be quite different from those prevailing at the start. To gain perspective on current and future commercial real estate markets it is important to look at historical experience and analyze CRE alongside the business cycle. Recently, concern has been rising about the health of the Texas commercial real estate market in the face of declining oil prices and their impact on the regional economy. Approximately 77 percent of total nonresidential construction values are concentrated in the Texas Triangle, which comprises the state's major metropolitan statistical areas (MSAs): Austin-Round Rock, Dallas-Fort Worth-Arlington (DFW), Houston-The Woodlands-Sugar Land, and San Antonio-New Braunfels. This article uses the term "commercial" to refer to total nonresidential construction, which includes a wide range of property types from office buildings to hotels, hospitals, and public sector development. The variations in regional industry mix can lead to different economic and commercial real estate market outcomes. For example, the presence of a strong energy sector in the Houston MSA generates different expectations for nonresidential real estate compared with the Austin MSA, where a strong technology industry is prevalent. Even before the current decline in oil prices, some concerns about CRE oversupply in the Texas Triangle were emerging. Until now, there have been no attempts to measure the ups and downs in local nonresidential construction to see if they match the timing of Texas' overall business cycle. The amount and volatility of nonresidential construction make it an important sector in the overall growth of the state's economy. 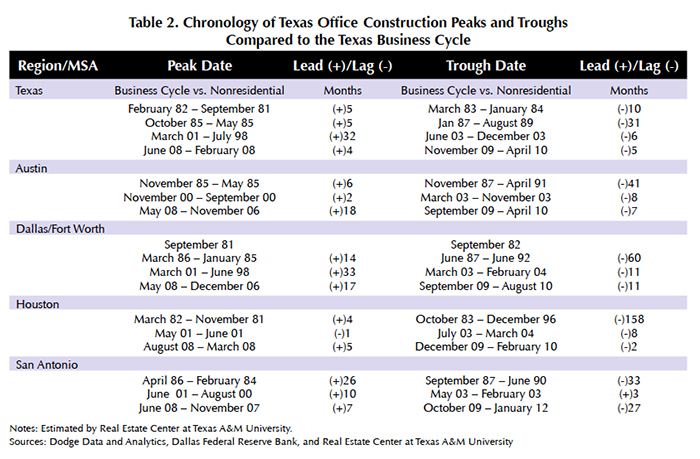 Given the relative volatility of commercial construction, the major peaks and troughs are identified along with Texas business cycle peaks by decade and major events, such as U.S. and Texas recessions and oil and housing booms (Tables 1–4). Values of new monthly construction—commercial and the subsectors of office, retail, and warehousing—are a good measure of current output in the CRE construction industry. Although it is a single variable, it is useful to identify the commercial construction cycle, as it is an important initial step in analyzing the ups and downs of the CRE sector. Indexing construction values in the figures allows for clearer and better comparisons between geographic areas and over time. 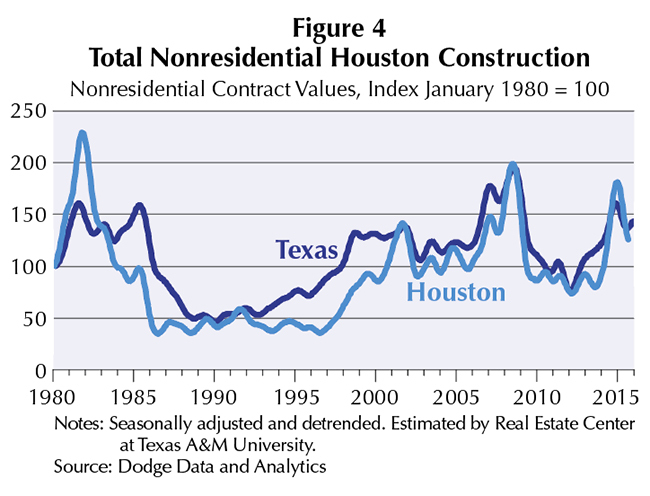 Commercial construction in Texas historically reached two major peaks, first in July 1981 and again in May 1985, driven primarily by oil prices and tax policy that granted investors large tax breaks for developing real estate (Figure 1). The result was a massive oversupply of commercial space that created serious financial problems for many real estate investors and financial institutions, leading to a major trough in January 1990. The overhang of the boom-and-bust period during the 1980s led to slow growth in construction through the early 1990s. 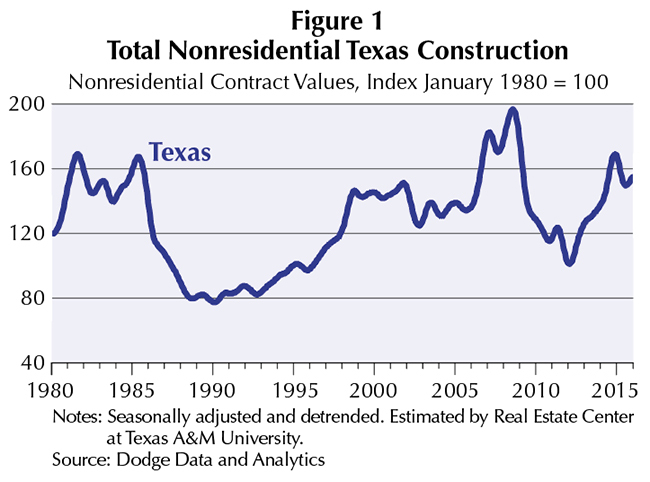 The growth rate of Texas commercial construction accelerated during the mid 1990s, reaching a plateau in September 2001. The national recession that began in March 2001, caused by the high-tech bust and the catastrophic events of 9/11, carried the United States and the Texas economy into recession and again slowed commercial construction, registering a trough in September 2002. Even though the U.S. economy emerged from its downturn in 2002, the Texas economy remained weak until June 2003. This caused a slow recovery in commercial construction until the end of 2005 when it accelerated to a historic peak in June 2008. As the financial crisis cast a shadow over commercial real estate, the following three years saw demand for office, retail, and warehouse space wither, increasing vacancy rates and lowering rents. The lack of commercial real estate lending paralleled the residential market. As a result, commercial construction dropped sharply, reaching a trough in December 2011. In the aftermath of the Great Recession, the Texas economy outperformed the nation, primarily due to strong energy and technology sectors. This led to a recovery in commercial construction that peaked in December 2014, about the time oil prices began their sharp decline. The slowdown of the Texas economy caused the rate of commercial construction to decline during 2015. 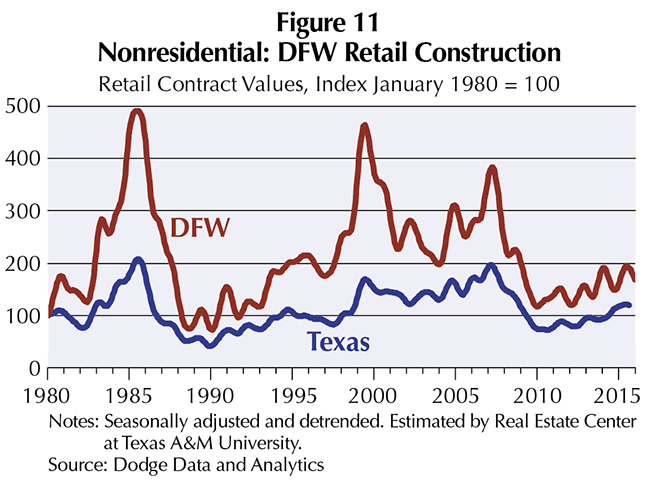 Commercial construction volatility by major Texas MSA varies with the size and diversity of the local economy. This becomes obvious when comparing commercial construction at the state level to the major MSAs. Significant volatility differences exist between the state and the major markets as well as among the major markets themselves. Austin and San Antonio display more volatility than Houston and DFW given the smaller size of their economies. 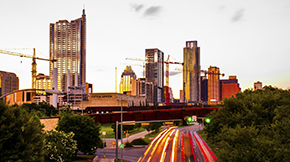 Austin's economy remains largely driven by technology and state government, while the Houston economy remains a global energy center. In contrast, the DFW economy is more highly correlated to the U.S. economy. San Antonio depends heavily on tourism and federal government employment, mainly through local military bases and a wide variety of private and public entities that support them. The differences in the composition of the four major Texas MSAs resulted in differences in local growth rates in total nonresidential construction. Austin registered the biggest average annual inflation-adjusted growth rate of 13.7 percent from January 1981 to November 2015, followed by San Antonio with 6.7 percent. Houston and DFW registered 4.6 percent and 4.0 percent annual growth, respectively. The state registered an average annual growth rate of 2.6 percent (Table 5). Together, the four MSAs produced, on average, 73.4 percent of all commercial construction in Texas between January 1980 and November 2015. DFW's share of new total nonresidential construction is 32.8 percent, followed by Houston with 24.8 percent, San Antonio with 8.5 percent, and Austin with 7.2 percent. 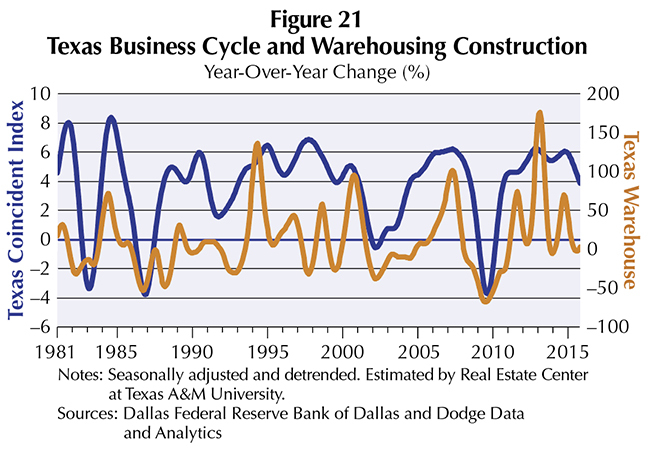 Major peaks and troughs in commercial construction reflect differences in local construction business cycles. 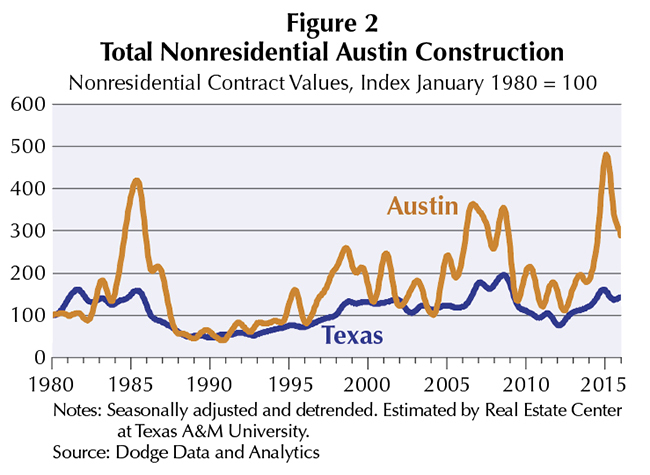 After reaching a small peak in 1983, Austin had its first major peak in construction activity in April 1985, coinciding with the state's oil boom. The MSA's largest peak occurred in December 2014 (Figure 2). In contrast, DFW and Houston reached major peaks in June 1985 and October 1981, respectively, during the unprecedented expansion in commercial real estate fueled by the 1980s oil boom and distorted federal tax laws (Figures 3 and 4). The peak before the Great Recession for DFW was March 2008. Houston peaked three months later, in June 2008. The largest San Antonio peak occurred in August 2007 at the end of the housing boom, followed by another in August 2014, as a prelude to the fall in oil prices (Figure 5). Not surprisingly the lowest troughs in total nonresidential construction were registered during the 1980s and early 1990s in the aftermath of the oil bust. Houston and San Antonio reached their lowest troughs in June 1986 and December 1989, respectively; the state in January 1990; and Austin and DFW in October 1990 and September 1992, respectively. Further commercial construction analysis segments the major MSAs by office buildings, retail structures and warehouses, which account for about 50 percent of the value of all private nonresidential construction from January 1980 to November 2015. 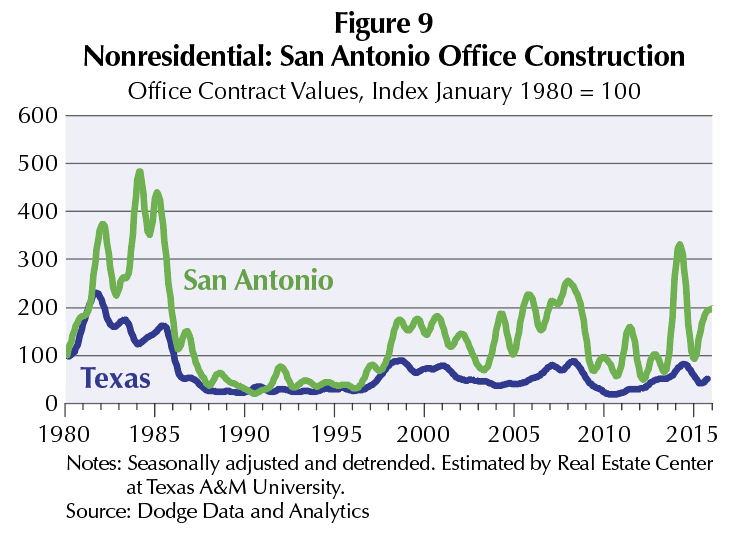 In the case of office construction, Texas and the major MSAs achieved their maximum peaks in the early 1980s, primarily as a result of the oil boom (Figures 6–9). 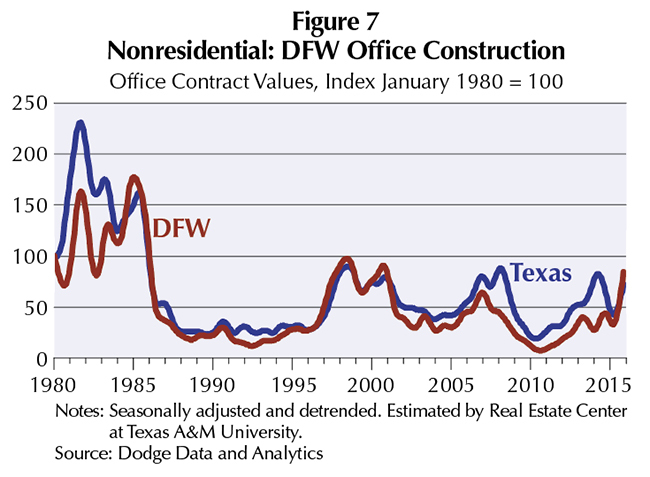 The lowest troughs for office construction were registered in the aftermath of the Great Recession in April 2010 in both Texas and Austin, and in August 2010 in DFW. In contrast, San Antonio and Houston recorded their lowest troughs in June 1990 and December 1996, as an oversupply of office space from the oil bust was still being felt. 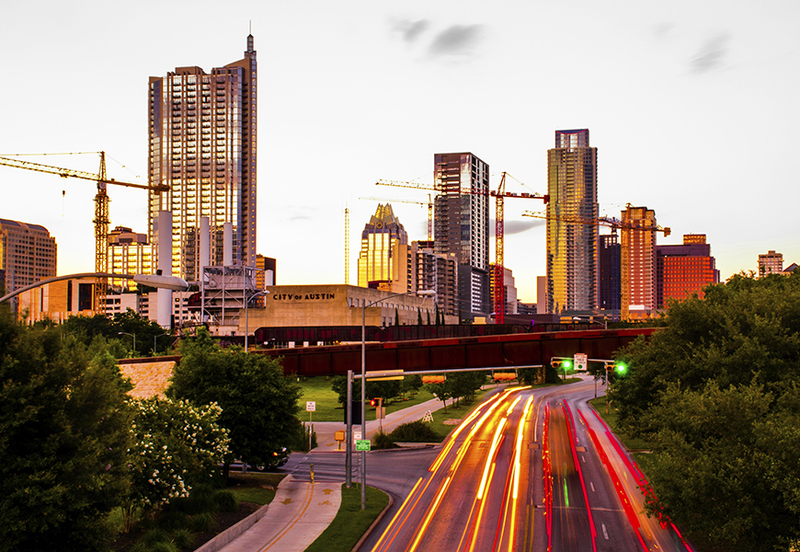 Austin recorded the largest office construction growth rate in real terms from January 1981 to November 2015, an average annualized rate of 22.4 percent. Houston followed with 16.5 percent, San Antonio at 16.3 percent, and finally DFW with 8.7 percent. The major MSA growth rates are greater than the state's 4.1 percent (Table 5) but with greater volatility (Tables 6 and 7). Houston surprisingly registers the highest volatility, followed by Austin, San Antonio, and DFW, which registers the lowest volatility (Table 6). In this regard, higher growth rates are accompanied by greater volatility in the office market. These four MSAs represent 82.2 percent of the new private office construction in Texas between January 1980 and November 2015. DFW's share of new office construction is 39.2 percent, followed by Houston with 27.3 percent, Austin with 8.8 percent, and San Antonio with 6.8 percent. 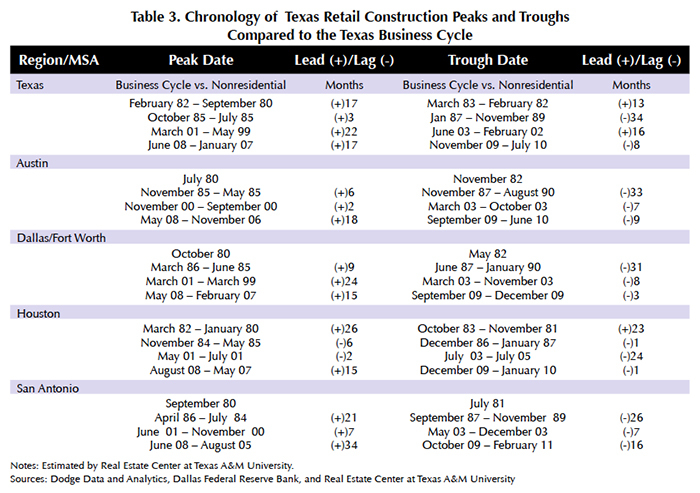 New retail construction in the state and DFW reached its maximum peak in July 1985 and June 1985, respectively, around the oil boom (Figure 11). 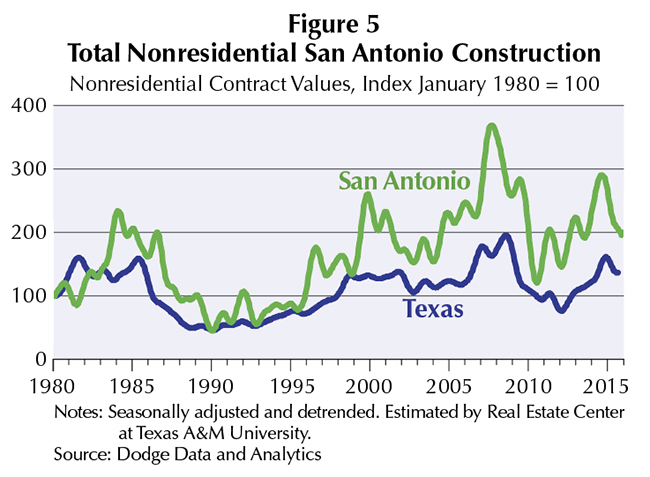 Austin and San Antonio achieved maximum peaks in the later stages of the housing boom, in September 2006 and August 2005 (Figures 10 and 13). 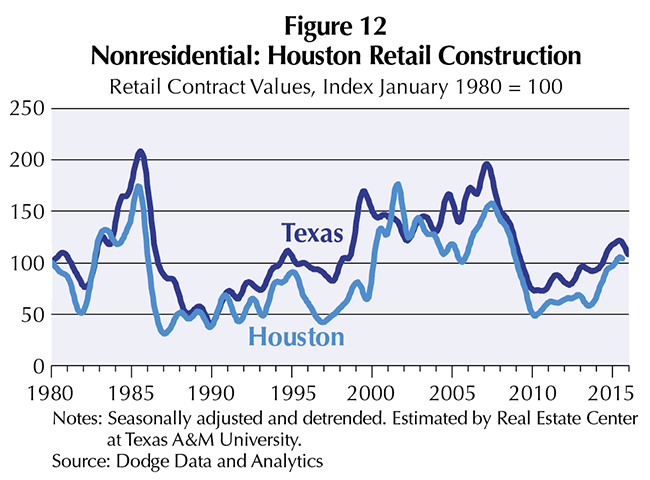 Surprisingly, Houston reached its maximum retail construction peak during the U.S. and Texas recession of 2001 (Figure 12). 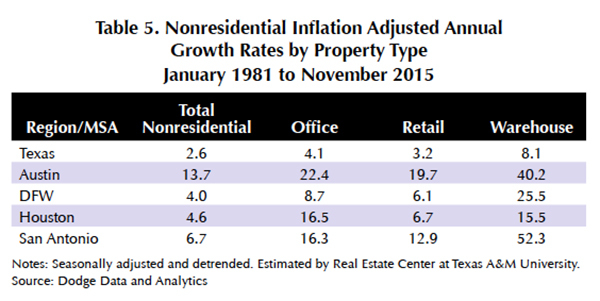 Like total nonresidential construction, new retail construction reached its trough in the 1980s and early 1990s. Both San Antonio and Austin recorded their lowest troughs in July 1981 and November 1982. The state and DFW reached their troughs in November 1989 and January 1990, after Houston had registered its low point in January 1987. 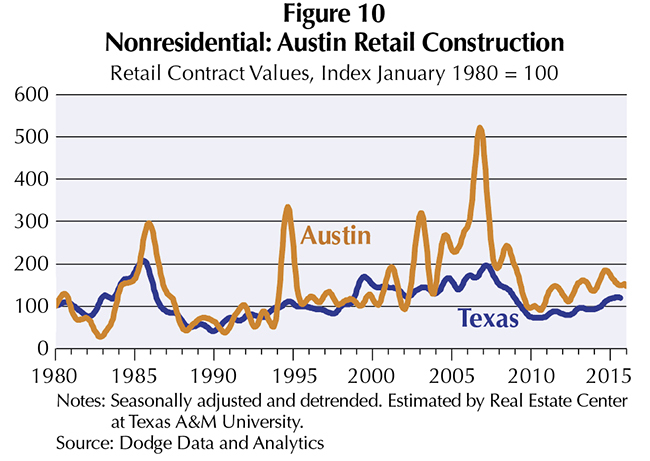 Austin registered the highest annual retail construction inflation-adjusted growth rate, 19.7 percent, between January 1981 and November 2015 followed by San Antonio with 12.9 percent, Houston with 6.7 percent, and DFW with 6.1 percent. The state recorded a 3.2 percent annual average growth rate (Table 5). Again, the relationship between growth rates and volatility is present as in retail construction. Surprisingly, DFW's volatility is slightly lower than that of Houston (Table 6), which registered similar growth rates. The four major MSAs represented 70.8 percent of all new private retail construction in the state between January 1980 and November 2015. DFW's share of new retail construction was 31.7 percent, followed by Houston with 23.6 percent, San Antonio with 8.5 percent, and Austin with 7.1 percent. 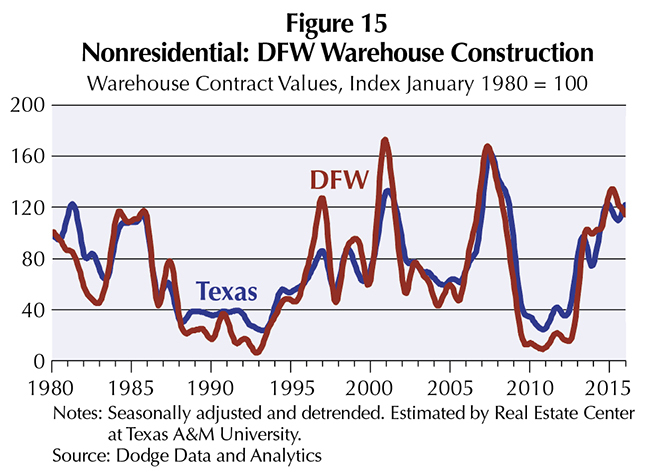 Before the Great Recession, new warehouse construction in Texas recorded its maximum peak in June 2007. Similarly, San Antonio reached its maximum peak in October 2007 (Figure 17), in contrast to Houston and Austin, which peaked at the start and the end of the oil boom, in March 1981 and September 1985, respectively (Figures 16 and 14). DFW reached its maximum peak at the end of the tech boom in November 2000 that gave way to the U.S. and Texas recessions of 2001 (Figure 15). 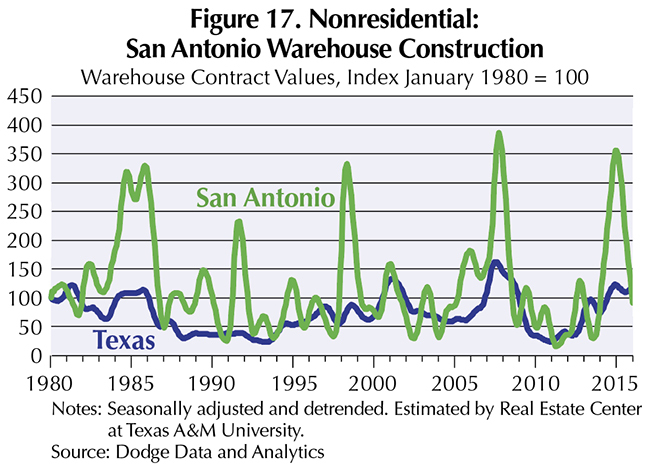 The state and the Texas Triangle MSAs, with the exception of San Antonio, reached their lowest point in warehouse construction activity during the 1990s as the state still felt the effects of the 1980s oil bust. Austin and DFW reached their troughs in May and October 1992, respectively, while the state and Houston fell to their lowest points in March 1993 and September 1996. 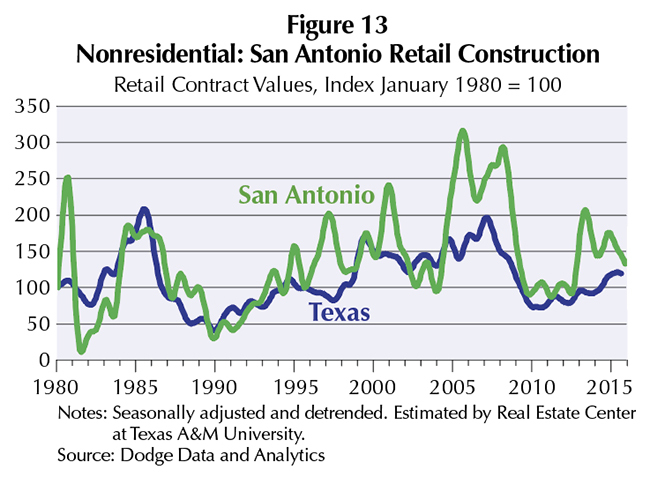 San Antonio did not reach its trough until February 2011 in the aftermath of the Great Recession. The largest average real annual growth rate in new warehouse construction was registered by San Antonio at 52.3 percent from January 1981 to November 2015, followed by Austin with 40.2 percent, DFW with 25.5 percent, Houston with 15.5 percent, and the state with 8.1 percent (Table 5). Once again, the relationship between high growth rates and high volatility is present (Table 6). Between January 1980 and November 2015, 75.7 percent of all growth in the state's new warehouse construction was concentrated in the major MSAs. DFW's share of new warehouse construction was 40.8 percent, followed by Houston with 24.8 percent, San Antonio with 6.2 percent, and Austin with 3.8 percent. 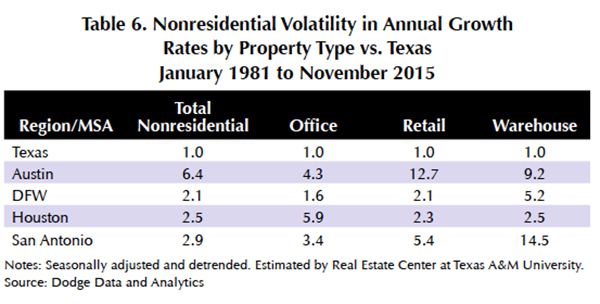 When comparing the volatility by property type in comparison to total nonresidential, the most volatile property type in general is warehouse followed by office and then by retail (Table 7). 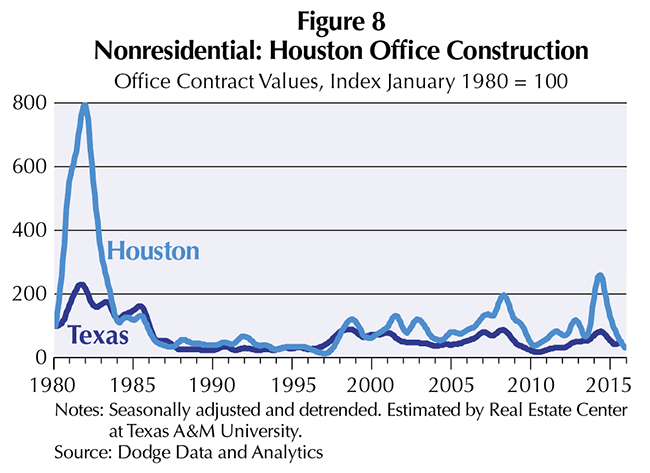 There are exceptions like Houston, in which the most volatile property type is office followed by warehouse, and Austin, where office registers the lowest construction variance. The volatility in commercial construction activity makes it difficult to clearly identify construction cycles. However, major construction peaks and troughs generally occur around major economic events such as recessions and periods of boom and bust. All these peaks and troughs share periods of expansion driven by external shocks from factors such as oil prices in addition to economic fundamentals such as employment growth in business and financial services. 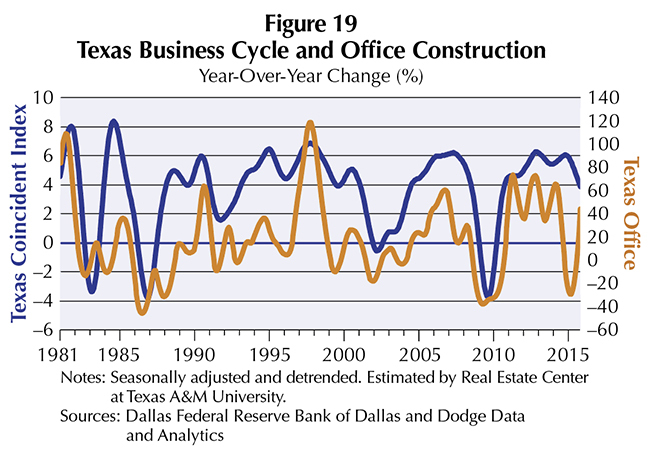 Just like the overall business cycle in Texas, each commercial construction cycle is different from previous ones because different economic factors affect the duration of expansion and contractions. As Tables 1–4 show, there is no time dependency on the duration of business cycles as each business cycle has distinct factors in play besides common characteristics that can lead to a turning point. 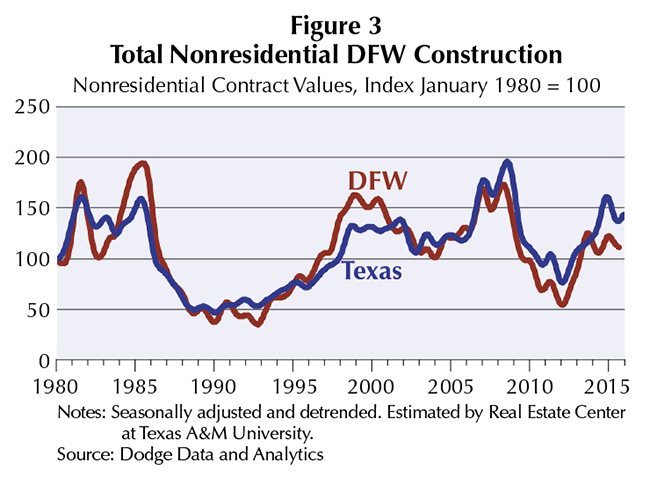 The Texas coincident business cycle index estimated by the Federal Reserve Bank of Dallas provides a basis to compare differences in the turning points of the Texas economy and CRE construction. It's possible that a slowdown in commercial construction affects the outlook of the general economy. 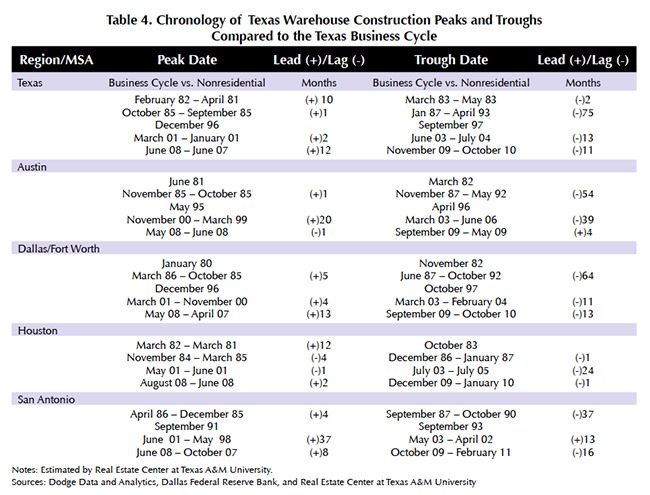 Interestingly, Table 1 and Figure 18 show that nonresidential construction peaks often lead the overall Texas economic business cycle, while the troughs consistently lag. Residential construction also leads the Texas business cycle, influencing the state's economic expansions and contractions and not conforming with the timing of the turning points in the overall Texas economy. Another difference is the duration of expansions and contractions as expansions are shorter and contractions last longer on average compared with the Texas business cycle. Still, surprisingly, no causal statistical relationship was found between the business cycle and nonresidential construction due to the volatility in the construction data. A further comparison was conducted using the residential business cycle determined by the Real Estate Center at Texas A&M University and the residential construction index estimated by the Federal Reserve Bank of Dallas and the Center. The comparison revealed that nonresidential construction lags both the peaks and troughs in residential construction (Table 8). 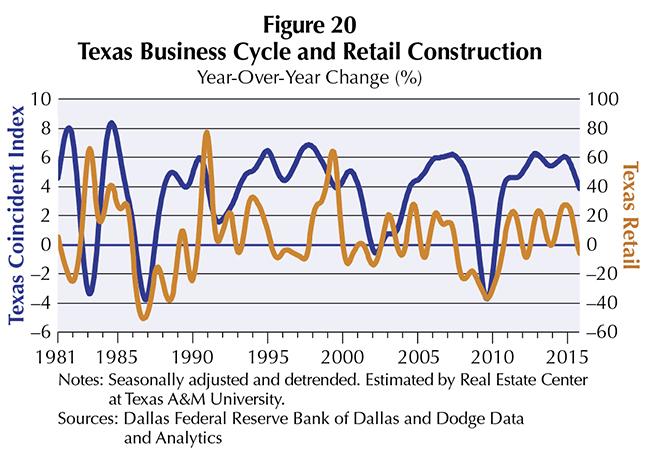 In addition, nonresidential construction follows more closely the overall Texas business cycle than residential construction. This highlights the differences between residential and nonresidential construction, the unevenness and volatility of CRE compared with residential construction and how housing leads the overall business cycle in the economy. Nonresidential construction in Texas and all four major MSAs declined during 2015 in conjunction with the general slowdown of the Texas economy. This is not surprising because every downturn in state nonresidential construction has been accompanied by a recession or the end of a boom and bust period that has generally lagged the construction cycle. In addition, all nonresidential construction cycles were dissimilar from previous ones due to differing economic conditions. It is too early to tell if the business cycle decline as an overall trend will continue in 2016, but early evidence confirms the Texas economy is slowing. 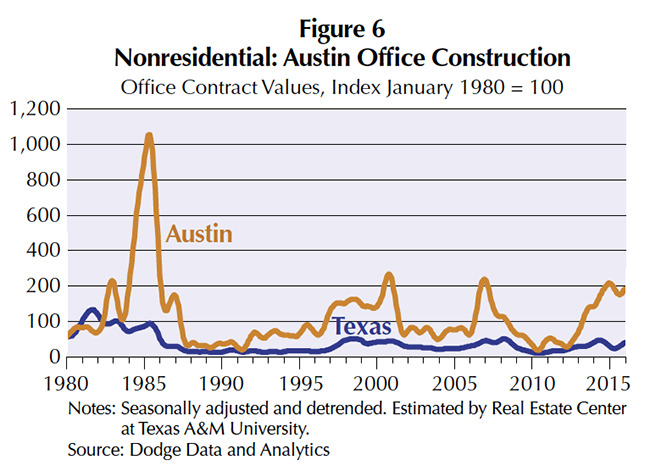 Construction of new office space in the state, Austin, and especially Houston has also declined during 2015. New retail construction has been mixed, while the state, Dallas, and Houston recorded an uptick during the majority of 2015 and then slowed at the end of year. This contrasts with Austin and San Antonio, where activity slowed during the year. Warehouse construction at the state level decreased during the first half of 2015, then experienced growth for the rest of the year. 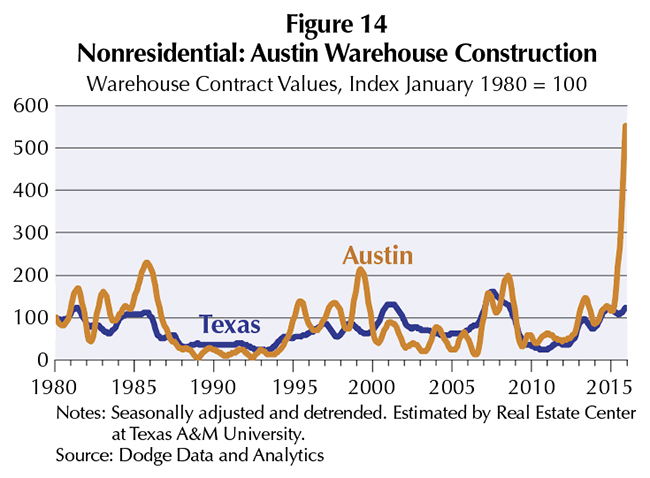 Austin warehouse construction is growing in contrast to DFW, Houston, and San Antonio, where construction fell in 2015. 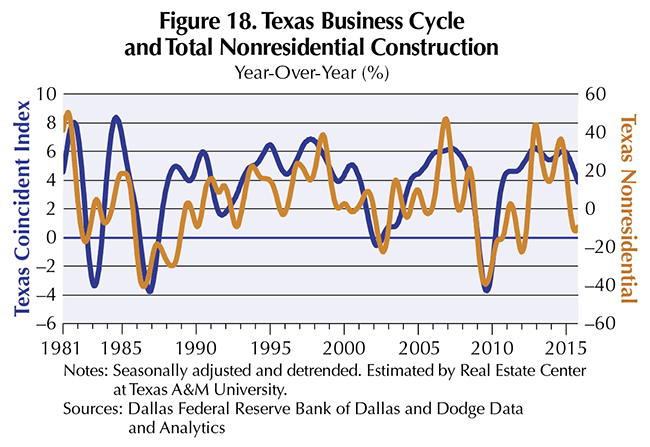 The Texas nonresidential construction cycle differed from the state business cycle and residential construction cycles. 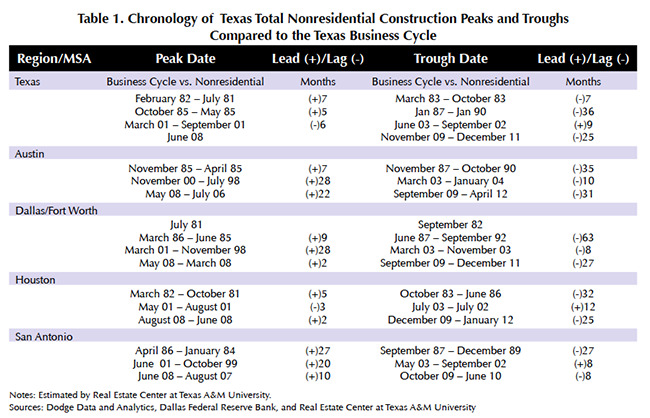 Nonresidential construction leads the Texas economy's peaks, and lags its troughs while consistently lagging the turning points of residential construction (Figures 19–21). This demonstrates the inherent differences between construction and market business cycles. The next step will be to look at other variables that may help indicate the turning points in the nonresidential construction business cycle. Once those are identified, researchers can construct a coincident indicator for nonresidential construction to mark precise peaks and troughs in the cycle and thus the timing and length of expansions and recessions. Such an indicator would resemble the residential construction business cycle estimated by the Federal Reserve Bank of Dallas and the Real Estate Center. Dr. Torres (ltorres@mays.tamu.edu) and Dr. Hunt (hhunt@tamu.edu) are research economists with the Real Estate Center at Texas A&M University. Browne, Lynn; Ca​​​​se, Karl. "How the Commerc​ial Real Estate Boom Undid the Banks," Federal Reserve Bank of Boston, Conference Series, 1992. Case, Karl. "The Real Estate Cycle and the Economy: Consequences of the Massachusetts Boom of 1984–87," Federal Reserve Bank of Boston, New England Economic Review, September/October 1991. Gaines, Jim; Torres, Luis. "The Dating Game: Texas Housing Construction Cycles," Real Estate Center at Texas A&M University, Tierra Grande, January 2015.